The main audit of RIGS in Ceredigion and Powys is now complete and a summarised report for each of the 130 sites is available to download in PDF format on this site. Click HERE to go to the RIGS listing introduction page (or follow the 5th link from the left in the main links-bar above). 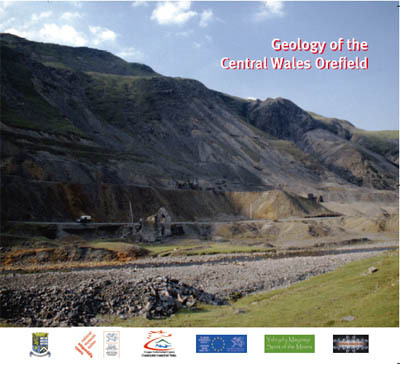 The Central Wales RIGS publication, "Geology of the Central Wales Orefield", is now out and available free from Tourist Information Centres in the Cambrian Mountains area. The 48-page bilingual booklet, fully illustrated in colour throughout, describes the geological evolution of the Central Wales area, where lead, silver, copper and zinc bearing lodes have been mined for many centuries. The narrative begins nearly a billion years ago, when Wales was situated close to the South Pole on the margin of the ancient supecontinent of Gondwana. The booklet was funded by Spirit of the Miners (the Ceredigion Uplands Regeneration Initiative) and by the Countryside Council for Wales. It was written by John Mason with Bill Fitches and Bob Mathews and the National Museum of Wales generously contributed some of their stunning mineral images, plus maps and other illustrations. It is hoped that the publication will be of interest to students and interested visitors alike. The Central Wales RIGS free leaflet, Pebbles on the Beach, may be obtained via Tourist Information Offices in the Mid-Wales area, and may be downloaded in PDF format HERE (1.38Mb). Right-click the link and select "Save as" to save to your PC. The map R shows how progress is being made in Central Wales to audit our important geodiversity sites in the last 18 months. Sites now recognised as RIGS are plotted as red dots. The map also shows sites that have been notified or audited since 1993 by NEWRIGS in Clwyd and Gwynedd & Mon RIGS in NW Wales. Thanks to Raymond Roberts, of the CCW Mold office, for creating the map. 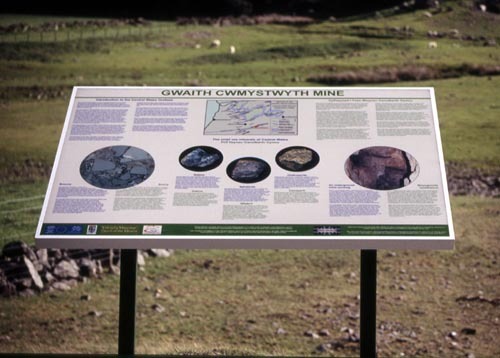 The Central Wales RIGS group is helping to explain the geological background of this once important mining district by erecting bilingual information panels at three of the more important mining sites in Ceredigion: Cwmystwyth, Cwmrheidol and Cwmsymlog. John Mason, among the most knowledgeable mineral experts in Wales, has done most to design the panels. Why these sites? 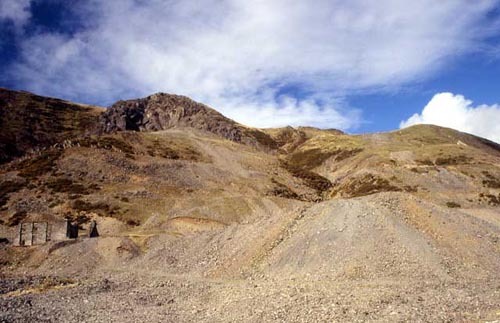 Cwmystwyth (above) is perhaps the most conspicuous mining area in the county, attracting a lot of curiosity from local visitors and tourists. Cwmrheidol is interesting largely because it gives us information on environmental hazards posed by some mines; that panel will be erected in the next few weeks. Cwmsymlog is special because its mines were a rich source of silver that once led to the foundation of an Aberystwyth Mint. The RIGS panel will be incorporated in an elaborate display that also covers the heritage aspects of the valley and especially the restoration of the mine chimney. In preparing the new information panels, RIGS has received the support of the Spirit of the Miners heritage project. The Countryside Council for Wales has helped fund the Cwmystwyth and Cwmsymlog panels, whilst the Environment Agency Wales has part-funded the one in Cwmrheidol. Staff of each of these organizations have also given much technical advice and encouragement. Landowners, too, have been most helpful. Feedback from Cwmystwyth indicates that the reaction from local residents has been very positive. Above: The Cwmystwyth information panel, at the eastern end of the site close to Nant Watkyn (the pink house and pottery). An informal workshop on current research in Wales was held on 25th May at the isotope labs at the British Geological Survey in Keyworth. It was attended by about 15 people, including Bill Fitches and John Mason of Central Wales RIGS. News on Central Wales from the meeting includes the following topics. The British Geological Survey began a month ago to map the Llanidloes 1:50,000 sheet. This project is to be carried out by a 7-person team in 12 months, and a preliminary map should be prepared in 2008. A sheet description booklet will eventually accompany the map. The Welshpool sheet has recently been remapped (mostly by Dr Richard Cave, retired from BGS, who is particularly helpful with RIGS advice) and should be available later this year or early in 2008, together with the sheet description. Plans are made to remap the Knighton sheet in 2007-8. The mysteries of the Dinas Mawddwy sheet will remain indefinitely. Jane Evans of the NERC Isotope Geochemistry Labs reported work in progress with BGS mappers on the Treffgarne Volcanics: erupted in the late Arenig - early `Llanvirn'. She has also obtained c.450 Ma Nd-Sm ages from diagenetic monazite in parts of Central Wales. 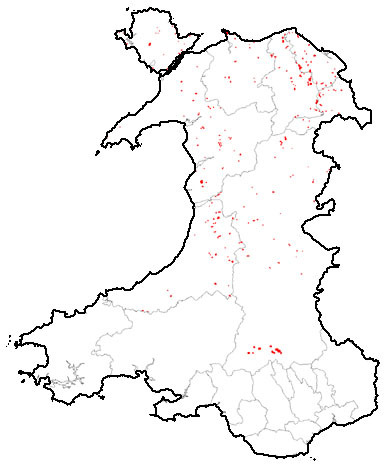 Future isotope work will focus on the Stanner-Hanter igneous complex in east Wales. Mike Howe (BGS) notes that a lot of BGS data are now accessible through the Web: palaeo, borehole, mineralogy, petrology, etc. They may accessed through the BGS website, following the link http://www.bgs.ac.uk/geoindex/. John Mason (CWRIGS) described the unusual mineralogy of syntectonic veins in brittle layers of NW Wales. Some rare earth-bearing minerals appear to have good potential for dating by Sm/Nd methods so might provide a way of dating deformation in the Welsh Basin. He also discussed the mineralogy and possible origins of iron-rich sedimentary-volcanic rocks in the Cadair Idris region, suspecting that black-smokers may have been involved. Alex Page (Leicester PhD) is working on effects of diagenesis, burial metamorphism and deformation on graptolites in the Welsh Basin. He infers that several of the changes, such as replacement or enveloping by chlorite, involve a volume loss during burial and before deformation. Sarah Sherlock (Leicester PhD) is studying strain shadows on graptolites in the Llangurig-Rhayader district. During cleavage formation, white micas and other minerals grew as fibres on the edges of fossilised graptolites. Sarah showed by using Ar/Ar isotope analysis that the growth, and hence cleavage formation, took place at c.396 Ma (early mid Devonian). Jack Soper pointed out that the c. 1.5 Ma time span for cleavage formation would indicate the shortest time length known for any orogeny. Bill Fitches suggested carrying out similar studies on a N-S traverse through the Welsh Basin to test for southward migration of deformation related to Iapetus closure as advocated in some geotectonic models. Other participants advocated expanding the project to include the Lake District, again to detect migration. Mark Williams (Portsmouth) is attempting to model early Palaeozoic oceanography, based largely on fossil communities and Pliocene analogues, which might lead on to climate modelling for that era. He pointed out that the Welsh Basin is ideal for this type of work, having a very wide range of faunal types (graptolites, trilobites, etc.) that can provide information, together with particularly accurate and detailed stratigraphic control. One target of this study will be to trace the effects of the Hirnantian (late Ordovician) glacial event throughout the various palaeolatitude zones. Another objective is to test whether various types of graptolite occupied different levels in the oceans. Soper, N.J. & Woodcock, N.H. (2003). The lost Lower Old Red Sandstone of England and Wales: a record of post-Iapetan flexure or Early Devonian transtension? Geological Magazine, 140, 627-647. RIGS LEAFLET NOW AVAILABLE ONLINE! A leaflet explaining, in Welsh and English, the role of RIGS groups in Wales, has now been produced. Hard copies are available from Bill Fitches or alternatively you may wish to download the leaflet in PDF format (only 247k) by clicking HERE. Over the May Bank Holiday long weekend (29th April-1st May, 2006), Bill Fitches of the Central Wales and Association of Welsh RIGS led a fieldtrip to Anglesey for the Severnside Branch of the Open University Geological Society. The 30-strong group, which included OUGS members from Cornwall and northern England as well as Severnside, were based at the Trearddur Bay Holiday Bungalows on Holy Island. Most of the Saturday was spent on Rhoscolyn Head on Holy Island, studying the Late Precambrian - Early Palaeozoic sedimentary rocks of the Monian Complex and traversing the Rhoscolyn Anticline of uncertain age. Despite the intense and complicated structures and the metamorphic overprint, we found examples of graded bedding, sole marks and other turbidite features as well as a conglomerate-filled channel. We also found spectacular pre-lithification structures produced by dewatering that were then deformed after lithification by tectonic folds and cleavage. Traversing across the Rhoscolyn Anticline, we used small-scale folds to determine the shape and orientation of the major fold. The steep to overturned SE limb comprises mainly S-bend folds, the hinge area includes M-folds, whilst the NW limb contains mainly Z-folds. Boudins and folded boudins were found in places. A poignant aspect of this traverse is the memorial plinth to Dennis Wood, who inspired generations of geology students through his teaching and friendship here and overseas. The plinth is sited on the anticline crest next to the Coast Guard lookout, appropriately selected to remind us of his contributions to Anglesey tectonics. Saturday's excursion finished by studying the serpentinite beside the road between Rhoscolyn and Four-Mile Bridge. The nearby gabbro quarry, however, has been fenced off from the normal access track, despite its GCR status and RIGS designation. This inaccessibility hindered our ponderings on the significance of the ultrabasic-basic bodies in this area: intrusive masses or a dismembered ophiolite? Sunday morning saw us at Cemaes Bay exploring the world-famous Gwna Melange, another part of the Monian Complex. Here we debated the possible origins of this widespread unit that contains fragments of limestone, dolomite, quartzite, basalt and other rock-types held in a sandy to muddy matrix. Greenly favoured a tectonic origin, but his successors have preferred a sedimentary explanation, notably as an olistostrome formed as the various components slid and slumped from a shelf into deeper marine settings. The Gadlys Quarry, between Cemaes and Llanbadrig, and once used for making lime, is cut in a huge kilometre-scale raft in the olistostrome. Careful hunting in the limestone revealed examples of the algal laminations and small domed stromatolites discovered by Margaret Wood and colleagues in the 70s. 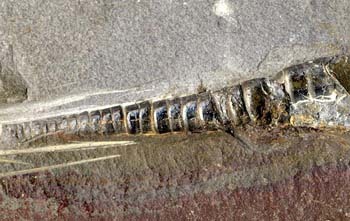 The age of these fossils is still uncertain as they range from Late Precambrian to Early Palaeozoic. On Sunday afternoon, we were introduced by David Jenkins to the Industrial Heritage trail of the Parys Mountain mining complex, the `Copper Mountain', near Amlwch. The mines, going back to the Bronze Age, were once world-renowned for copper production, gave us the term copper-bottomed, and helped our Elizabethan ships to turn on a sixpence and defeat more ponderous enemies. This open-cast site is now famous for its lurid landscape, coloured by various iron-rich minerals, which mimics many a modern volcano. It was occasionally used by the BBC in the 1970s as an "extraterrestrial" filming location for Dr Who! David demonstrated the extreme acidity (pH about 1.4) of some surface water, noting that our ancestors used that property to cure animal hoof problems: some sheep-dip! A search for graptolites in the Silurian slates in the core of the Parys Mountain Syncline yielded several straight Monograptids, whilst Jenny Baker found some unusual curly versions that may have research potential. Llanddwyn Island, near Newborough, was our destination on the morning of Bank Holiday Monday. Just outracing the rising tide, we viewed the spectacular pillow lavas in the crags between the island and mainland, noting the way-up signatures, looking for vesicles and chilled margins, finding inter-pillow jasper-carbonate-epidote aggregates, and examples of breccia that resulted from implosions of pillows. This assemblage, probably of back-arc basin origin, may be part of a major raft within the Gwna Melange. The tide got its own back, beating us to the Tertiary basalt dykes that cut the pillow lavas in places. Before dispersing at lunchtime, we visited a blueschist site in SE Anglesey, recently designated a RIGS by the Gwynedd & Mon RIGS group. These basic rocks are distinctly blue-purple because of their high Na-amphibole content and are more easily studied here than the more traditional Marquis of Anglesey's statue site. Particular thanks for access are due to Mr & Mrs Jones who own and farm this land. Thanks are also given to Margaret Wood, chair of the Gwynedd & Mon and Association of Welsh RIGS groups, who made useful suggestions on the itinerary. Margaret is heavily committed to helping Anglesey achieve Geopark status later this year, and we wish her and her team all success in their application. A gallery of images from the trip can be enjoyed by clicking HERE. The Central Wales RIGS group visited the Nantymoch area near Plynlimon on Saturday 1st April, braving a cold wind and occasional hail shower. 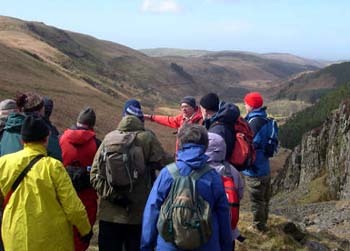 26 people joined in the trip, and we were pleased to welcome along members of the Mid Wales Geological Society, the Cambrian Mountains Society, some from Shropshire and others from South Wales. Geology teacher, Brian Clissold, transported several of us in the Penglais school mini-bus. One main objective was to examine the c. 430-420 million year old Late Ordovician and Early Silurian sedimentary rocks exposed in the quarries of Carn Owen (L). They are included in one of our Regionally Important Geodiversity Sites. In the main quarry, we admired the chaotic assemblage of sandstone blocks in a mudstone matrix, the Late Ordovician Carn Owen melange, and discussed possible origins: unconsolidated mud injected upwards into sand layers by diapiric action? ; the collapse of a submarine channel margin? Richard Cave showed us a copy of the 1:10,000 scale map he had made of the area when compiling the 1:50,000 Aberystwyth sheet for the British Geological Survey in the 1980s. 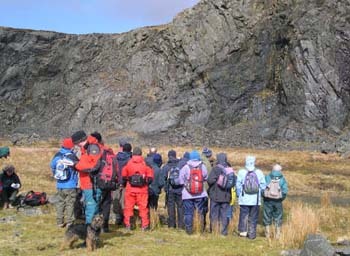 Denis Bates showed maps he prepared while training Geology undergraduates at Aberystwyth University, whilst Brian Clissold explained how Penglais geology classes are taught to map in the same area. Denis, Richard and Richard Hartnup gave an account of the industrial history of the Carn Owen quarries and the mines nearby. The Ordovician-Silurian boundary was picked out on the east flank of Carn Owen, largely on the basis of the transition from grey to black mudstones. Bill Fitches explained that the grey sediments were deposited on a well-oxygenated seafloor, whereas the black mudstones containing much rusting pyrite and graptolite fossils record anaerobic bottom conditions. On the west flank of Carn Owen, we found loose pieces of shale containing pyritised graptolites and orthocone shells. A good example of an orthocone, 5cm long, is illustrated below: it was found here back in the 1980s. Bill drew attention to the global context of Carn Owen. In the Late Ordovician Africa, S. America, Australia & Antarctica made up the Gondwana Supercontinent: Wales and neighbouring parts of Europe were situated some distance from Gondwana. In the Hirnantian stage of the Late Ordovician, an icecap formed on parts of Gondwana that lay at the south pole. To make the ice-cap, water was withdrawn from the oceans, leading to a global sea-level drop of 200 m and the exposure of shallow marine platforms to erosion. Eastern Wales was probably exposed in this way and it is possible that some of the submarine channels in eastern and central Wales were cut at this stage: palaeovalleys containing highly disturbed sediments, much like the one at Carn Owen, are a characteristic Hirnantian feature of Algeria, Libya, Saudi Arabia and elsewhere. When the ice-cap melted, about 2 million years later in the Early Silurian, global sea-level rose again and flooded the shallow shelf areas with organic-rich black mud. These muds, including the famous Tannezuft Shale of Libya that closely resembles our black shale in Central Wales, generated huge amounts of oil and gas which migrated into the Late Ordovician palaeovalley sandstone reservoirs. Very likely our Late Ordovician and Early Silurian rocks also formed a hydrocarbon play, but fortunately/unfortunately the oil and gas were dispersed by heating during deep burial and by folding and faulting. Now for power we have to make do with windmills covering our hills instead of nodding donkeys. John Mason led us down the incline from the Carn Owen quarries to the site of the Hafan Mine, situated on the Hafan Fault and another of our Central Wales RIGS. Here we found on the mine dumps samples of galena (lead ore), sphalerite (zinc ore) and chalcopyrite (copper ore), embedded in brown ferroan dolomite (iron-rich carbonate) and white quartz. The polyphase nature of the mineralisation in Central Wales was explained: in simplistic terms, early polymetallic mineralisation involved lead, zinc and copper but also notable silver, iron, nickel, cobalt, antimony and traces of arsenic and gold. This was followed in places by renewed brecciation and the deposition of locally major quantities of ferroan dolomite. Later mineralisation was contrastingly simple in its mineralogy, involving large tonnages of galena and sphalerite with quartz, whilst the final stage of mineral deposition consisted of abundant marcasite. It was explained that the fragmentation (brecciation) of the mineral veins, the deposition of minerals and the faulting were all caused by hydraulic fracture processes: hot, high-pressure, saline fluids circulating in the crust scavenged metals from the deep rocks then burst their way towards the surface to make the mineral veins and provoke faulting. Returning to the icy history of the region, Eva Sahlin took us to the viewpoint at the eastern end of Nantymoch Dam to show us a Holocene spill way, some 10,000 years old. While we were appropriately lashed by hailstones, Eva pointed out that the valley seen below the dam is part of an Ice Age feature, higher parts of which are drowned by the reservoir. The valley is too big to have been carved by the little, misfit stream now flowing along it, so this valley and several others in this part of Ceredigion are interpreted to have been cut by melt-waters from the Welsh icesheet. Eva also indicated on maps the positions of other Ice Age features in the region, notably striated rock surfaces and small cirques related to the latest phases of glaciation and deglaciation. In view of the interest in this topic, we will ask Eva to run a longer field trip in Central Wales to show us more of her PhD work on the Quaternary - once the hills of Ceredigion have thawed out a bit more.